Through customized interviews, we evaluate the needs and treatment possibilities for each patient. 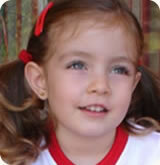 If the auricular malformation is important, it is advisable to talk with the patient´s parents, so that the child may undergo the surgery at an early age, being 5 or 6 years-old, to avoid the emotional stress when beginning school. 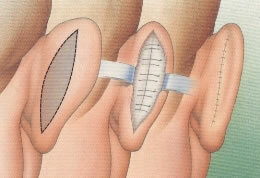 We select the ideal otoplasty technique for each case. 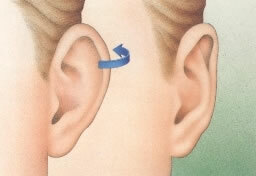 Probably the most common is the procedure performed for protruding or “cup handle” ears; in which, by means of an incision in the back of the ear, we eliminate a section of skin and auricular cartilage. We later reshape the ear and bend it towards the skull. The scar remains practically hidden. Surgery performed in the back of the ear. We usually use local anesthesia plus sedation given by the anesthesiologist. The surgery takes about 60 – 90 minutes and after a brief period for recovery, the patient can get back home. For the first postoperative days we place a protective bandage. Complications can occur like in any other surgical procedure, such as hematoma, seroma, infection, exaggerated scars, etc. Yet, they are infrequent. The medical advises must be followed strictly to prevent them.